The Harvard School of Engineering and Applied Sciences (SEAS) and the Alícia Foundation have developed a new General Education science course, “Science and Cooking: From Haute Cuisine to the Science of Soft Matter,” which recently began this Fall. The course — which is unfortunately limited to currently enrolled Harvard undergraduates — will use food and cooking to “explicate fundamental principles in applied physics and engineering”. So whilst I continue to wish that they offered this type of a course back when I was still in college, I will simply have to settle for attending the topic-related public lectures given by guest chefs and faculty affiliated with the course. I’ve been helping out at the Monday night lectures with a couple of my old SEAS coworkers and it has been quite an experience so far. Let me just say that when the organizer said it would be crazy to do crowd control, she was not kidding. 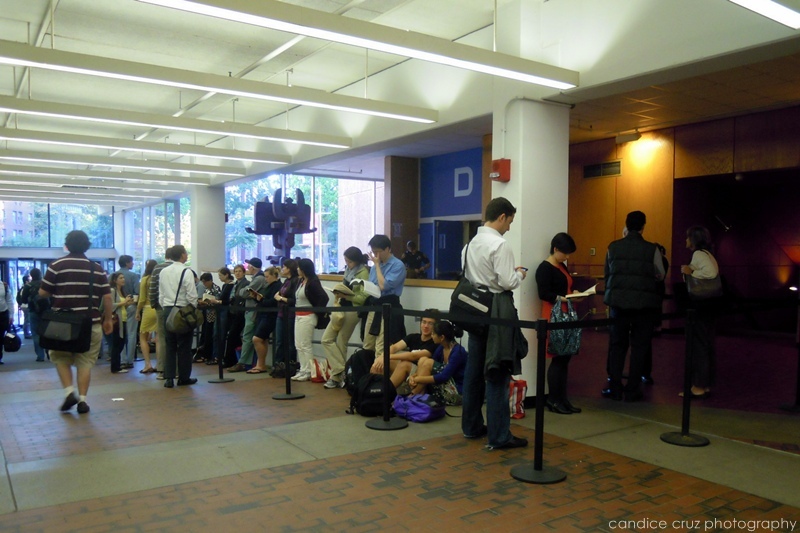 Seating for the lectures are on a first-come first-serve basis and people begin lining up way before the start time of 7 pm (think like before 5 pm, no kidding!). 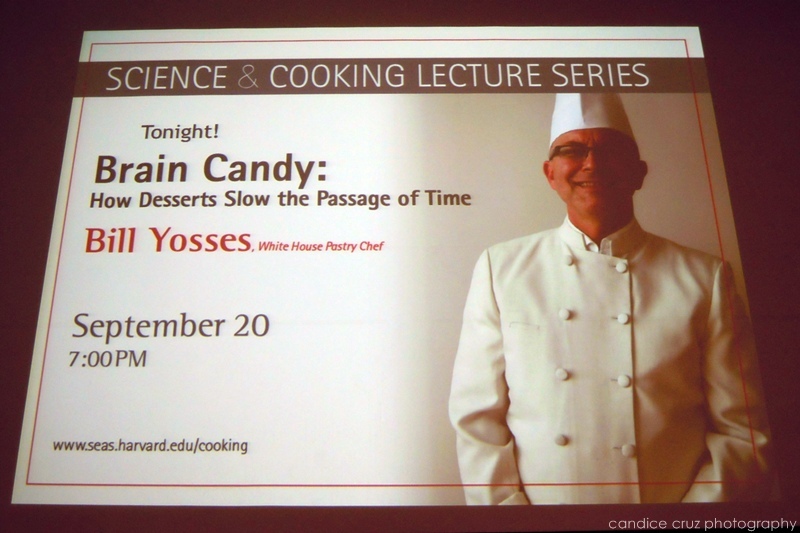 I saw a woman cry because she couldn’t get in to see Bill Yosses (the current White House Pastry Chef)! The lectures start off with a brief description from one of the Harvard professors, and then it is followed by a broad-based talk by the chef that may or may not contain material relevant to the course lecture. 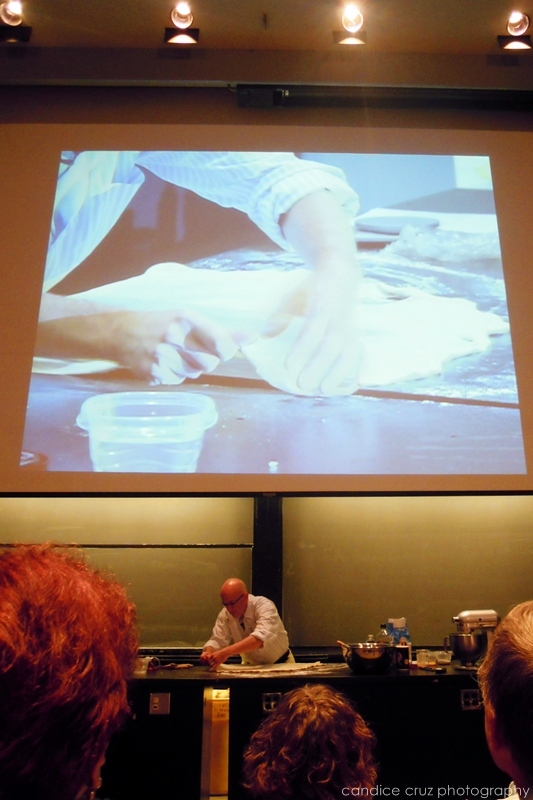 Bill Yosses talked about desserts and did a few demonstrations like elasticity, and it was pretty cool because as a volunteer I got to sit in the third row. He melted chocolate to make a mousse and it smelled so good as it filled up the auditorium! 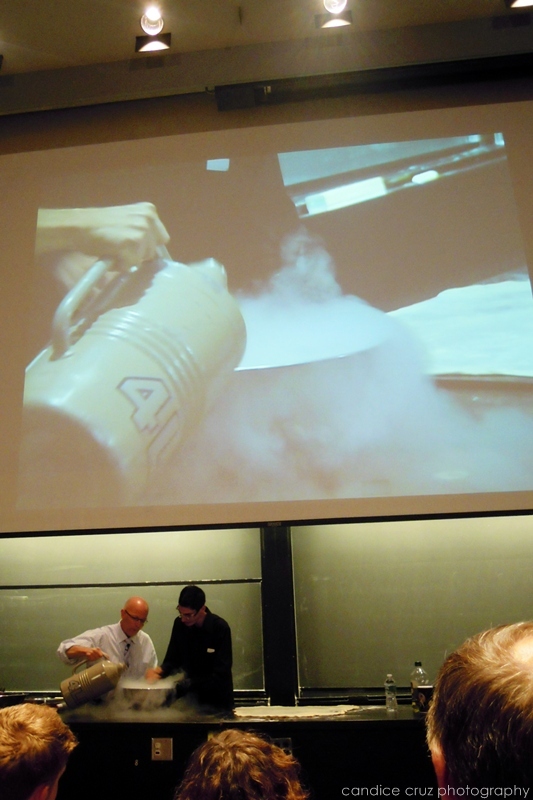 He also made an olive oil ice cream using liquid nitrogen and it was incredible to see how quickly it came together. Obviously, this is probably something I would never attempt to do at home, but still pretty cool to watch. He has a cookbook out called “The Perfect Finish” which the Harvard Coop had available at a book signing after the lecture. 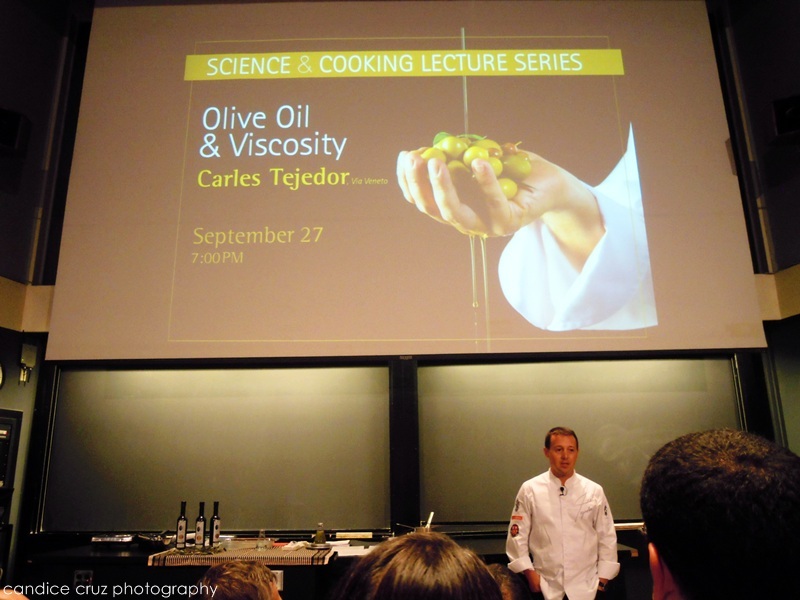 The other lecture that I got to help out at was on 9/27 and it was called “Olive Oil and Viscosity” by Carles Tejedor (of Via Veneto). It was a great presentation on how olive oil can be used to achieve different textures and consistencies when mixed with other elements. He gave out a little sample cup of olive oil that had a toothpick- pierced piece of olive oil gelatin. It was pleasantly sweet and savory at the same time. One thing that I really liked about Chef Tejedor’s presentation that was different from Chef Yosses’ was how he incorporated mini videos demonstrating some of the dishes they create at his restaurant. Some of them were so complicated and intricate in design, I couldn’t imagine what it would be like to actually be in Spain enjoying his creations. I can imagine though that it’s probably not an inexpensive outing! It was pretty cool to see how much time and work he put into his presentation, too. Everything had so much detail — from the Harvard logo embroidered onto his chef’s coat, the demonstration videos of how to make things with gelatin, to the little olive tree leaf that he gave to each attendee — which really illustrates his passion for his work. There are more food and science lectures going on every Monday through December (except for the one on 10/26 which features Jose Andres, which falls on a Tuesday evening) so be sure to check out the calendar. And hey, if you go to one in November or December, you’ll probably see me there! This entry was posted in cooking, harvard, olive oil, Uncategorized by shortcakescraps. Bookmark the permalink.